Picture this: a student is slouched in her chair, staring blankly at the board. A group at the back is deep in a discussion of the previous day’s ODI match. A few are fighting to pay attention, only to be distracted by someone’s controversial opinion about the opening batsman’s performance. One or two students have given up and put their heads down on the desks to take a nap. 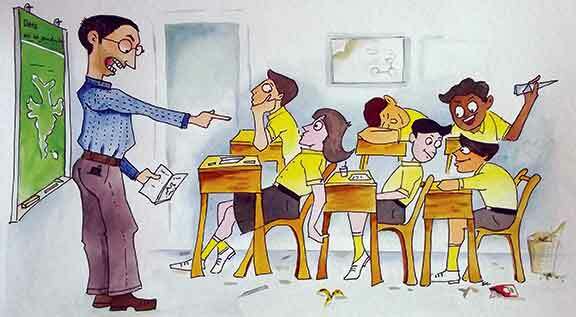 The teacher has to shout to get the attention of the class, and even so some children aren’t listening. It’s chaos. Now picture this: students are leaning forward in their chairs and animatedly discussing a topic. A few people in the front row are carefully copying a diagram from the chalkboard to share with their classmates later. Children are sitting up straight, focused on the teacher, writing in their notebooks and waiting their turn to ask a question. One scenario sounds like a nightmare that is unfortunately all too common in some classrooms. The other sounds idealistic, a distant dream. But is it really that impossible? It is likely you have at some point experienced the first scenario I have described. Your students simply do not pay attention and almost nothing is achieved. It’s frustrating for the teacher, and the few students who try to pay attention. The culture in this classroom is not positive. Teachers are unhappy, students don’t learn, and progress is minimal. An improvement in the classroom culture might help. What is classroom culture? It’s a little difficult to properly define it, but I interpret it as the environment that is created by both teachers and students, to build a space that fosters learning and understanding. A culture that encourages questions, builds tolerance, and fosters intellectual growth. In my experience of school – I’ve had almost 13 years of it – it is a collaborative effort between teachers and the taught. In the past 12 years, I have studied in five schools, across four states and two countries. As a student, I’ve experienced many classroom cultures, with dozens of teachers. And here’s what I also know: while it is a collaborative effort, given the hierarchy of the traditional school system, it is the teacher who has the greatest power to create a classroom culture that is open and supportive, with a focus on learning, and acceptance of all types of learners. Teachers are of many types and personalities, and they each have their own effects on their students! One year, my class had five different mathematics teachers. One of them marketed maths like a salesman selling a product, catching our attention by sharing mental maths shortcuts and bonding with us by discussing the ongoing cricket world cup. The next absolutely terrified us, tearing pages out of notebooks if the work was substandard. The other three were careful, maintaining discipline, but allowing or encouraging us to ask questions if we didn’t understand something. Over the years, my friends and I have encountered many different kinds of teachers, each with their own unique personality, teaching a different subject, and with his or her own teaching style. But we’ve come to realize that the ones we remember, the ones we love, the ones we learn the most from, share some characteristics. First, they encourage questions. We were not afraid to ask a doubt, or made to feel silly for saying we couldn’t understand something. We could debate, question, and challenge, and it was all part of the classroom discussion. Second, they related what we were learning to life around us. At our age, this feels very important, because why else would we be sitting in a classroom on a hot day trying to understand complex concepts and theories, when we could be doing…well, anything else? These two characteristics in a teacher make a world of difference. You can see that, when you answer a student’s question about a subject, they are more willing to keep working, and less likely to become demotivated. They will pay attention in class, creating less disturbance and maybe making your day just a little less stressful. You have probably noticed this already. As a student, I often hear my classmates complaining about not understanding something that was taught in class. By encouraging students to ask questions and allowing them to admit that they do not understand something, you are helping them gain confidence. They are less likely to tune out, and more likely to participate. The other thing I’ve noticed is the increase in students’ interest when they see a connection between what they are studying in school and what they see around them, in newspapers, or on TV. When a student realizes that diffusion, explained in the science textbook, is the concept used in the dialysis treatment of a relative, or when they better understand how the election results affect governance, because they’ve studied parliamentary structure in civics class. Connections like these give us context for what we learn, and make those units seem more connected with our everyday lives. Dear teachers, we know you work hard preparing for each day of class, planning the order of topics, checking the material, preparing projects, homework, and exams. It must be tiring and difficult to stand in the front of a classroom with a sea of confused faces staring blankly at you, every day of the week, and still manage to smile and teach. There are days when we, the students, can be a handful. There are days when we are sleepy, lazy, confused, or unmotivated, when we can’t seem to focus. It must be incredibly frustrating for you. Yet there are also days when we are focused and excited. We try to see that the good days outnumber the bad ones. Most days, we look forward to school and we want to learn and understand and explore. We are looking for connections to the real world. Please show us how that big corporate house we’ve all heard of used a business strategy that is explained in our textbook, or how studying Hamlet is relevant to us today. Ask us questions. Challenge our understanding of what you have taught us, and see whether there is anything we have missed. Encourage us with a smile when we try, whether or not our answers are correct, and help us learn from our mistakes. Bring your enthusiasm to us. Show us how much you love your subject, and maybe we’ll catch some of that passion. Break the monotony once in a while and try something new: maybe organize a quiz, make us try to teach each other a topic, or have a couple of classes in the playground or garden. Help us feel safe admitting that we don’t understand something. Let us ask genuine questions, even if they sound foolish, without fear or hesitation. And finally, make a joke or tell us something you care about, or enjoy doing. Remind us that you’re human too, because sometimes, on those days when we are tired and unfocused, we forget. Help us realize that you’re not robots or dragons, you are real people, because sometimes, when you are having a bad day too, we forget. Ultimately, we spend a lot of time together, several hours a day, several days a week, for years. We’ll try to focus on the good days, push through the bad days, and justify all of your effort. Help us, and together we can create a classroom culture that will make us all happy. The author is a 12th standard student living in Mumbai. She is the author of one published fantasy novel, ‘Enchantress of Elektra’, and aspires to be a professional writer. She can be reached at kaivallyadasu@yahoo.com.